1. According to Gen. xxii. 22, a descendant of Arphaxad (compare Gen. xi. 13-22). He was the son of Nahor and Milcah, and father of Laban and Rebekah. Since in Gen. xxv. 20 and xxviii. 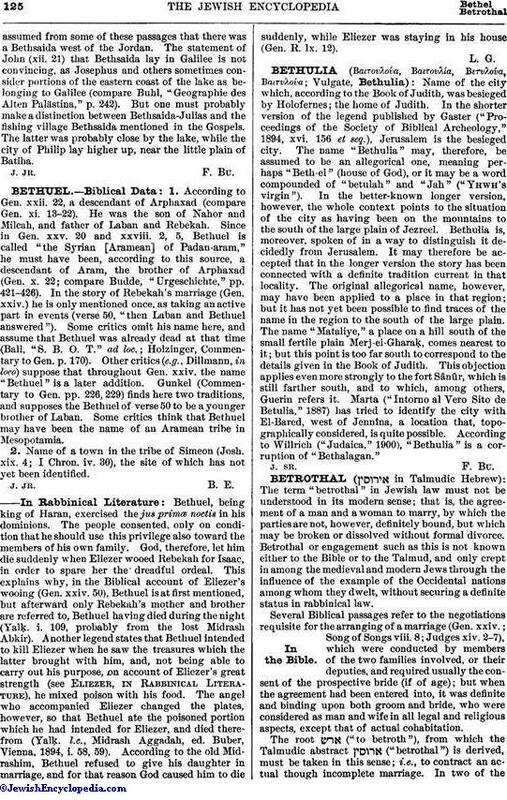 2, 5, Bethuel is called "the Syrian [Aramean] of Padan-aram," he must have been, according to this source, a descendant of Aram, the brother of Arphaxad (Gen. x. 22; compare Budde, "Urgeschichte," pp. 421-426). In the story of Rebekah's marriage (Gen. xxiv.) he is only mentioned once, as taking an active part in events (verse 50, "then Laban and Bethuel answered"). Some critics omit his name here, and assume that Bethuel was already dead at that time (Ball, "S. B. O. T." ad loc. ; Holzinger, Commentary to Gen. p. 170). Other critics (e.g., Dillmann, in loco) suppose that throughout Gen. xxiv. the name "Bethuel" is a later addition. Gunkel (Commentary to Gen. pp. 226, 229) finds here two traditions, and supposes the Bethuel of verse 50 to be a younger brother of Laban. Some critics think that Bethuel may have been the name of an Aramean tribe in Mesopotamia. 2. Name of a town in the tribe of Simeon (Josh. xix. 4; I Chron. iv. 30), the site of which has not yet been identified. Bethuel, being king of Haran, exercised the jus primœ noctis in his dominions. The people consented, only on condition that he should use this privilege also toward the members of his own family. God, therefore, let him die suddenly when Eliezer wooed Rebekah for Isaac, in order to spare her the dreadful ordeal. This explains why, in the Biblical account of Eliezer's wooing (Gen. xxiv. 50), Bethuel is at first mentioned, but afterward only Rebekah's mother and brother are referred to, Bethuel having died during the night (Yalḳ. i. 109, probably from the lost Midrash Abkir). Another legend states that Bethuel intended to kill Eliezer when he saw the treasures which the latter brought with him, and, not being able to carry out his purpose, on account of Eliezer's great strength (see Eliezer, in Rabbinical Literature), he mixed poison with his food. The angel who accompanied Eliezer changed the plates, however, so that Bethuel ate the poisoned portion which he had intended for Eliezer, and died therefrom (Yalḳ. l.c., Midrash Aggadah, ed. Buber, Vienna, 1894, i. 58, 59). According to the old Midrashim, Bethuel refused to give his daughter in marriage, and for that reason God caused him to die suddenly, while Eliezer was staying in his house (Gen. R. lx. 12).